MHC class II regulatory factor RFX1 is a protein that, in humans, is encoded by the RFX1 gene located on the short arm of chromosome 19. The RFX1 gene is a member of the regulatory factor X (RFX) gene family, which encodes transcription factors that contain five conserved domains including a highly conserved, centrally located, winged helix DNA binding domain as well as a dimerization domain located in the C-terminal region of the sequence. Apart from the five conserved domains, the RFX proteins diverge significantly. The DNA binding and dimerization domains of the RFX family proteins show no similarities to the other domains with the same functions in other proteins. The RFX protein family is conserved in S. pombe, S. cerevisiae, C. elegans, mice and humans. There are seven known RFX proteins in humans, five in mice, and one in C. elegans as well as one in each of the two species of yeast. The protein encoded by this gene is structurally related to regulatory factors X2, X3, X4, and X5. It is a transcriptional activator that can bind DNA as a monomer or as a heterodimer with RFX family members X2, X3, and X5, but not with X4. 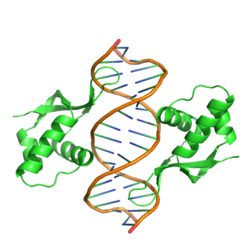 This protein binds to the Xboxes of MHC class II genes and is essential for their expression. Also, it can bind to an inverted repeat that is required for expression of hepatitis B virus genes. The RFX proteins were originally cloned and characterized due to their high affinity for a cis-acting promoter sequence, called the Xbox, found in all MHC class II genes. Levels of mRNA encoding this protein as well as RFX2 and RFX3 are found to be consistently elevated in the testis and are variable in other tissues throughout the body. RFX1 contains a C-terminal sequence with no apparent homology to other RFX proteins. This C-terminal tail contains an acidic region that is thought to aid in crossing the nuclear membrane. Two major functions are hypothesized to this exist for this domain: a contribution to the nuclear localization signal (NLS) as well as the contradictory down-regulation of DNA binding as well as nuclear association. These two functions were originally identified through sequence mutations and translational fusions with gfp (green fluorescent protein) and remain to be confirmed. RFX1 has been shown to interact with Abl gene. ↑ Pugliatti L, Derre J, Berger R, Ucla C, Reith W, Mach B (Sep 1992). "The genes for MHC class II regulatory factors RFX1 and RFX2 are located on the short arm of chromosome 19". Genomics. 13 (4): 1307–10. doi:10.1016/0888-7543(92)90052-T. PMID 1505960. 1 2 3 4 Reith W, Ucla C, Barras E, Gaud A, Durand B, Herrero-Sanchez C, Kobr M, Mach B (Feb 1994). "RFX1, a transactivator of hepatitis B virus enhancer I, belongs to a novel family of homodimeric and heterodimeric DNA-binding proteins". Mol Cell Biol. 14 (2): 1230–44. PMC 358479 . PMID 8289803. 1 2 "Entrez Gene: RFX1 regulatory factor X, 1 (influences HLA class II expression)". ↑ Emery P, Durand B, Mach B, Reith W (March 1996). "RFX proteins, a novel family of DNA binding proteins conserved in the eukaryotic kingdom". Nucleic Acids Res. 24 (5): 803–7. doi:10.1093/nar/24.5.803. PMC 145730 . PMID 8600444. 1 2 3 Agami R, Shaul Y (April 1998). "The kinase activity of c-Abl but not v-Abl is potentiated by direct interaction with RFXI, a protein that binds the enhancers of several viruses and cell-cycle regulated genes". Oncogene. 16 (14): 1779–88. doi:10.1038/sj.onc.1201708. PMID 9583676. ↑ Aftab S, Semenec L, Chu JS, Chen N (2008). "Identification and characterization of novel human tissue-specific RFX transcription factors". BMC Evol. Biol. 8: 226. doi:10.1186/1471-2148-8-226. PMC 2533330 . PMID 18673564. ↑ Katan-Khaykovich Y, Shaul Y (May 2001). "Nuclear import and DNA-binding activity of RFX1. Evidence for an autoinhibitory mechanism". Eur. J. Biochem. 268 (10): 3108–16. doi:10.1046/j.1432-1327.2001.02211.x. PMID 11358531. Herrero Sanchez C, Reith W, Silacci P, Mach B (1992). "The DNA-binding defect observed in major histocompatibility complex class II regulatory mutants concerns only one member of a family of complexes binding to the X boxes of class II promoters.". Mol. Cell. Biol. 12 (9): 4076–83. PMC 360302 . PMID 1508204. Reith W, Herrero-Sanchez C, Kobr M, et al. (1991). "MHC class II regulatory factor RFX has a novel DNA-binding domain and a functionally independent dimerization domain.". Genes Dev. 4 (9): 1528–40. doi:10.1101/gad.4.9.1528. PMID 2253877. Sáfrány G, Perry RP (1993). "Transcription factor RFX1 helps control the promoter of the mouse ribosomal protein-encoding gene rpL30 by binding to its alpha element.". Gene. 132 (2): 279–83. doi:10.1016/0378-1119(93)90208-K. PMID 8224874. Siegrist CA, Durand B, Emery P, et al. (1993). "RFX1 is identical to enhancer factor C and functions as a transactivator of the hepatitis B virus enhancer.". Mol. Cell. Biol. 13 (10): 6375–84. PMC 364696 . PMID 8413236. Emery P, Durand B, Mach B, Reith W (1996). "RFX proteins, a novel family of DNA binding proteins conserved in the eukaryotic kingdom.". Nucleic Acids Res. 24 (5): 803–7. doi:10.1093/nar/24.5.803. PMC 145730 . PMID 8600444. Doyle J, Hoffman S, Ucla C, et al. (1996). "Locations of human and mouse genes encoding the RFX1 and RFX2 transcription factor proteins.". Genomics. 35 (1): 227–30. doi:10.1006/geno.1996.0343. PMID 8661125. Katan-Khaykovich Y, Shaul Y (1998). "RFX1, a single DNA-binding protein with a split dimerization domain, generates alternative complexes.". J. Biol. Chem. 273 (38): 24504–12. doi:10.1074/jbc.273.38.24504. PMID 9733744. Iwama A, Pan J, Zhang P, et al. (1999). "Dimeric RFX proteins contribute to the activity and lineage specificity of the interleukin-5 receptor alpha promoter through activation and repression domains.". Mol. Cell. Biol. 19 (6): 3940–50. PMC 104353 . PMID 10330134. Zajac-Kaye M, Ben-Baruch N, Kastanos E, et al. (2000). "Induction of Myc-intron-binding polypeptides MIBP1 and RFX1 during retinoic acid-mediated differentiation of haemopoietic cells.". Biochem. J. 345. 345 (3): 535–41. doi:10.1042/0264-6021:3450535. PMC 1220788 . PMID 10642512. Morotomi-Yano K, Yano K, Saito H, et al. (2002). "Human regulatory factor X 4 (RFX4) is a testis-specific dimeric DNA-binding protein that cooperates with other human RFX members.". J. Biol. Chem. 277 (1): 836–42. doi:10.1074/jbc.M108638200. PMID 11682486. Sengupta PK, Fargo J, Smith BD (2002). "The RFX family interacts at the collagen (COL1A2) start site and represses transcription.". J. Biol. Chem. 277 (28): 24926–37. doi:10.1074/jbc.M111712200. PMID 11986307. Nakayama A, Murakami H, Maeyama N, et al. (2003). "Role for RFX transcription factors in non-neuronal cell-specific inactivation of the microtubule-associated protein MAP1A promoter.". J. Biol. Chem. 278 (1): 233–40. doi:10.1074/jbc.M209574200. PMID 12411430. Norquay LD, Yang X, Sheppard P, et al. (2003). "RFX1 and NF-1 associate with P sequences of the human growth hormone locus in pituitary chromatin.". Mol. Endocrinol. 17 (6): 1027–38. doi:10.1210/me.2003-0025. PMID 12624117. Maijgren S, Sur I, Nilsson M, Toftgård R (2004). "Involvement of RFX proteins in transcriptional activation from a Ras-responsive enhancer element.". Arch. Dermatol. Res. 295 (11): 482–9. doi:10.1007/s00403-004-0456-5. PMID 15024578. Beausoleil SA, Jedrychowski M, Schwartz D, et al. (2004). "Large-scale characterization of HeLa cell nuclear phosphoproteins.". Proc. Natl. Acad. Sci. U.S.A. 101 (33): 12130–5. doi:10.1073/pnas.0404720101. PMC 514446 . PMID 15302935.